$30 value T-Mobile prepaid SIM card The Wall Clock Messenger Cam will hang on the wall, posing as a normal wall clock, but will send MMS images to your phone whenever somebody walks in to the room. Simple to install and easy to setup. This camera is the best choice for vacation homes, storages, closet, boat and other areas with limited entry. 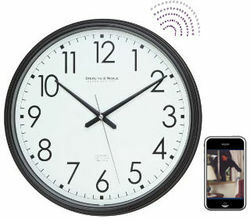 The Wall Clock MMS Messenger Cam sends pictures automatically to your phone. 5 Snapshot pictures will be sent in 1 seconds increments as long as the each motion is being detected by the camera.